Sarah is an occupational psychologist with an interest in coaching and writing. Running her own business (and family) means that there is not as much time to write creatively as she would like (although there is a novel in the drawer from a nanowrimo bout a few years ago), so Sarah decided to channel her writing urge into a blog, book and articles connected with her work. Sarah’s typical clients are organisations and individuals who are facing much uncertainty and change, and whose well-being may be neglected or suffering as a result. Sarah’s first book (Keeping Your Spirits Up) was self published in 2011. She continues to write a blog and newsletters via her website and is developing ideas for a further book to do with making the most of middle age and onwards, in both career and other terms. She has a business background as an accountant and has always blended numbers and words, arts and science – and therefore doesn’t comfortably fit in any genre (which she understands to be a hindrance in publishing terms). She was too daunted by the idea of thousands of rejections to seek an agent or publisher for her first book, and is undecided about how to tackle any future publishing. 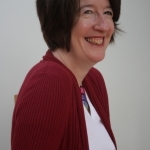 Her creative writing training includes two Open University courses which she enjoyed immensely. Sarah speaks regularly to organisations and to local business and professional groups on themes arising from her work and writing. Aside from family life, work, reading and writing, she is a keen walker who regularly goes Nordic walking as well as having a long term plan to walk the South West coast path. I have spoken on themes to do with my writing to corporate groups such as PwC and Arup; local business groups such as Antenna; and local interest groups such as CafeSci. I work with adults.